While there's often no shortage of those wanting to take part, just as important are the host of people who devote their time to teaching, leading and organising the sport and physical activity that takes place across Nottinghamshire. 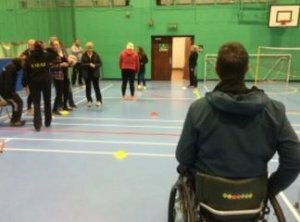 For those wanting to get into coaching or volunteering, attend a new course or search for new ideas, Active Notts can help provide the answers. If you are interested in getting involved in coaching this section will provide information about qualifications, local opportunities, funding, national resources and programmes to support Nottinghamshire coaches. If you are interested in becoming a coach we have the courses available in Nottinghamshire for you. How to Deliver Engaging Sessions - An interactive, practical session that looks at ideas around great sessions and getting the best from your participants. Both sessions come with a supporting resource and are accredited with a certificate for attendence. Games and Ideas - Completely practical session around getting new ideas and games to use in your coaching, comes with free DVD/ CDrom. What Sport or activity to Coach? Its up to you what you'd coach, but its ideally something you have a passion for or would like to learn more about. You don't have to have played the sport at a good level to be a good coach in it. Some of the most famous coaches weren't great players or even played their sport at all before they started coaching! The key aspect of coaching is the ability to relate to people and their development and get the best out of them. Skills like communication, patience, enthusiasm, compassion and creativity are a great starting point or can be developed through coaching and working with more experienced coaches. We also have a range of documents and information on our guidance and support page, including our take on the coaching pathway, best practice guidelines, mentoring opportunities, minimum operating standards and links to other key organisations you may find useful.